My name is Zoe Grant, owner and founder of the company handling all managing. My skills and areas of expertise include CDOT Transportation and Erosion Control Supervisor. 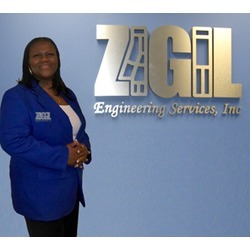 My professional title is president at ZGL Engineering Services, Inc, which specializes in provides Engineering CAD Services for Infrastructure and Mining and Reclamation and Construction Field Services Support. We provide exceptional civil construction documents to organizations of all sizes. Business Administration and Civil Engineering educational and professional development includes classes at Metropolitan University/Denver, University of Colorado/Denver and South Puget Sound Community College/Washington. I am currently involved with American Society of Civil Engineers, Colorado Department of Transportation, City and County of Denver, Regional Transportation of Denver, Colorado Black Chamber of Commerce, U.S. Green Building Council. My hobbies and interests include travel. I am drawn to and passionate about charitable organizations such as Zeta Phi Beta Sorority, Inc., Haiti Medical Mission providing Water Storage Tank and Purification System, Colorado Coalition for Homeless, MEED Backpacks for the homeless in Colorado.